Our selective invoice finance and invoice auction, support service, will guide you through the process of finding a selective invoice finance company and checking the price for your business - it is normally approximately 2% per month but that will vary based on your circumstances and who provides the facility. REQUEST A CALL TO DISCUSS SELECTIVE INVOICE FINANCE or use the simple quote request form to the right of this page (below if you are using a mobile/tablet). This form of alternative finance, often offered by FinTech companies (finance technology companies) is growing rapidly at present, and we are adding providers to our panel on a regular basis - hence there is a wide choice. In many cases, without the need to give personal guarantees or have any minimums or any obligation to use the service. The service has only recently become available and is often favoured for its flexible approach, allowing customers to pick and choose when they use the service. You don't have to auction your invoices, some funders provide their own funds against the invoices that you select, or you can choose peer-to-peer finance (P2P funding provided by one or more businesses like yours). There are many funding options. Many customer prefer to know that a single funder is financing their business, but others prefer the pricing advantages of an auction style bidding approach. This kind of finance has benefits over gaining investment from investors, as you do not have to give up any ownership of your business. You can finance individual invoices (or batches of invoices) as small as £2,000 (or even lower - in some cases) on a one off basis, without any obligation to continue. You will have no contractual obligation to use the service again. There is NO requirement to have more than one client for this type of invoice financing. You can receive bad debt protection if you wish, so that you get paid even if your customer fails. Put simply, you select the sales invoices that you want to receive funding against, rather than receiving funding against all or your sales ledger (known as whole turnover). You raise your credit invoice, to your customer, as normal. This process can also work for a batch of invoices that you select. You submit the invoice(s) to the invoice finance company for funding. This may be by email or via an upload facility that they provide. The funder will normally undertake some for of due dilligence/verification of the invoices. The invoice finance company provides you with a part payment against that invoice (at an agreed percentage) immediately. You can use that cash for any purpose. Either you chase the invoice(s) for payment (if necessary) yourself or they can do this for you if you prefer - some funders offer this service free of charge. When the invoice is paid, the funder will pass the balance of the invoice to you (less their charge for the service). Here you will find the single invoice finance options explained, in detail. Different funders access their funding in different ways. In some cases they use their own funds (or a line of credit with a major organisation such as a bank), others have investors, and some use a peer-to-peer ("P2P") approach. This is where you borrow funds invested by other businesses like yours. Alternatively there are Ebay style auction options available, where potential investors bid to fund your business. 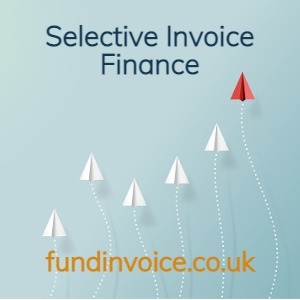 How Much Does Selective Invoice Finance Cost? The cost will depend upon the nature of your business, your circumstances, the amount you want to raise and for how long you need the money. This is an actual: example of the cost of selective invoice finance (VAT may be payable on all or part of the fees) where the fees to access £800 against each £1,000 of oustanding invoicing worked out at just £15.50 for 21 days. The fee structure may vary between providers, some will charge you a sign up fee but others don't and we may be able to ask for this to be waived for you. Invoice auctions work in a very similar way to that explained above. The key difference is that a the funding is not provided by the invoice finance company. Rather it is provided by investors that bid on your invoice, or batch of invoices, to win the opportunity to fund them. Similar to an Ebay style auction. This can lead to very competitive funding rates. If you would like a quote for selective invoice finance or want to know the cost of using an invoice action site, please REQUEST A CALL BACK and we will be able to help you find one (or more if you choose) quotations for your business. There is no obligation for you to go any further and our service is completely independent. List Of Selective Invoice Finance Companies You Can Contact - these are the providers that offer selective services. The Advantages And Disadvantages Of Invoice Auctions - the pros and cons of auctions. Selective Spot Factoring - Case Study - an example of spot factoring helping a client. The Cost Of Using An Invoice Auction Site (Blog post) - an explanation of the costs. Open Ended Contracts And Short Notice Periods - contractual terms and notice periods explained.